JAKARTA — The Indonesian Environment and Forestry Ministry has vehemently rejected a claim made by Greenpeace – that over 1,000 Bornean orangutans are threatened by illegal operations in a logging concession situated in West Kalimantan’s Ketapang regency – as completely distorted, irresponsible and baseless. The ministry went further, saying that Greenpeace’s actions in this case are a major embarrassment which will hurt its own credibility, as in fact there is no field-based evidence to justify the NGO’s allegation that such a vast number of orangutans are threatened by the very small-scale illegal logging taking place in the 37,000-hectare PT MPK logging concession. Greenpeace, by ridiculously overstating the impact of minor illegal logging operations in just a few small spots, has revealed itself to be engaged in a campaign to mislead the global public, given the reality that the majority of the concession concerned still consists of relatively intact peat forests. 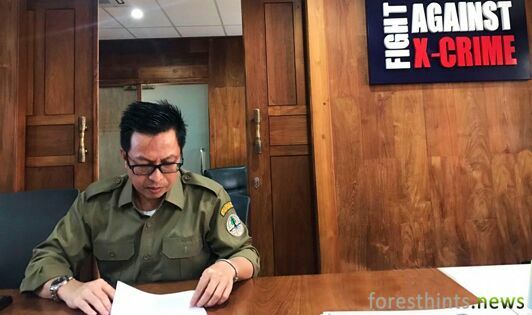 The ministry’s forceful dismissal of Greenpeace’s claim was conveyed by the Ministry’s Nature Conservation and Ecosystems Director General Wiratno in a presentation he made at the ministry building on the real threat level facing Bornean orangutans due to the minor illegal logging operations in the PT MPK concession (Jun 22). “Unsurprisingly, Greenpeace chose not to mention in its press release how many hectares have been affected by illegal logging in the PT MPK concession, seeing that this number is actually very small. The illegal logging operations happening there can in no way be classed as major, but are minor in scale,” he explained. “The threat to over 1,000 Bornean orangutans exists only in Greenpeace’s imagination, it is not something real,” Wiratno added. In his presentation, the director general played a video showing one of the spots in which these minor illegal logging operations are occurring. The surrounding area depicted is clearly still covered by peat forests, undermining Greenpeace’s claim that over 1,000 orangutans are at risk from the illegal logging operations. Director General Wiratno asserted that Greenpeace’s campaign to exaggerate field evidence is a blatant effort on its part to diminish the peat reforms being undertaken by President Joko “Jokowi” Widodo – reforms which in fact are unprecedented in Indonesia’s history. “Greenpeace seems to be trying to cover up the facts about the level of peat reforms clearly being carried out by President Joko Widodo, orchestrating a campaign to deceive the global public about the threat posed to orangutans in the logging concession,” he said. 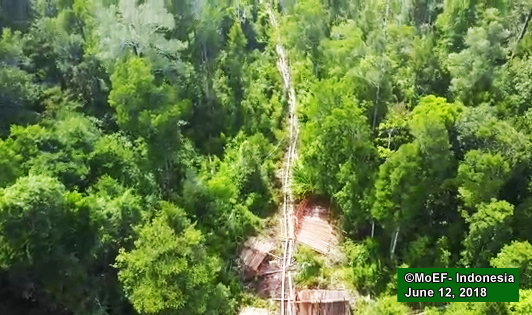 Below are several photos, taken from the video, which the director general presented to underline how Greenpeace has unfairly twisted the facts by not showing that most of the Bornean orangutan’s habitat in the PT MPK concession is still composed of relatively intact peat forests. “Greenpeace has embarrassed itself by covering up the facts and failing to reveal that the land cover in the PT MPK logging concession is largely made up of relatively intact peat forests in which the Bornean orangutans continue to live,” the director general explained. In the meantime, the Ministry’s Law Enforcement Director General Rasio “Roy” Ridho Sani provided an update (Jun 22) that, based on data and information previously gathered by the ministry in the form of both field evidence and intelligence data, law enforcement measures are already underway in this case. “Ground-based evidence confirms that there is no real threat to over 1,000 Bornean orangutans in the PT MPK concession as a result of low-level illegal logging in some spots there. 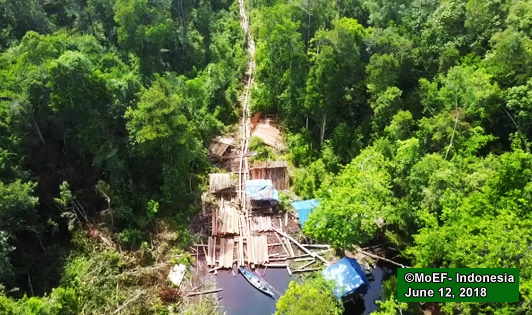 Since the imposition of a sanction compelling the company to end its operations in April 2017, the concession remains dominated by relatively intact peat forests,” the Law Enforcement Director General affirmed.